Demodex mite infestation usually remains asymptomatic, but may be an important causative agent for many dermatological conditions. Demodex , a genus of tiny parasitic mites that live in or near hair follicles of mammals, are among the smallest of arthropods with two species Demodex folliculorum and Demodex brevis typically found on humans. Infestation with Demodex is common; prevalence in healthy adults varying between 23-100%. , Demodex infestation usually remains asymptomatic, although occasionally some skin diseases can be caused by imbalance in the immune mechanism. In this article, we have described the mite and have highlighted its dermatological importance. 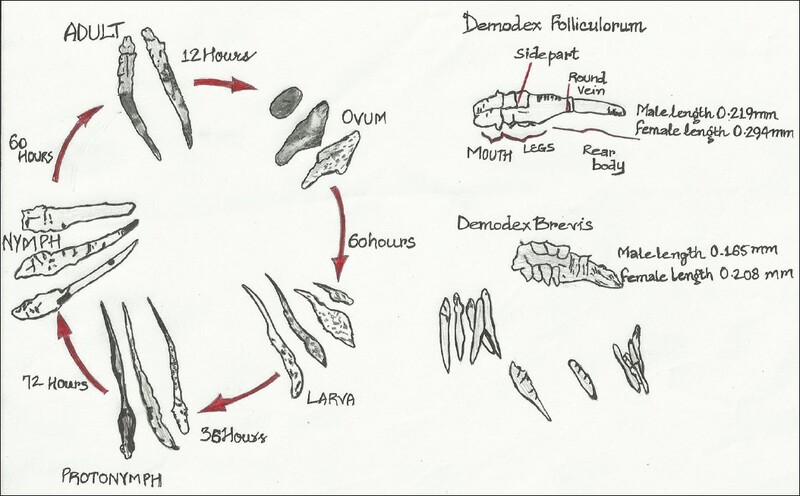 Female Demodex are somewhat shorter and rounder than males. Both male and female Demodex mites have a genital opening and fertilization is internal. 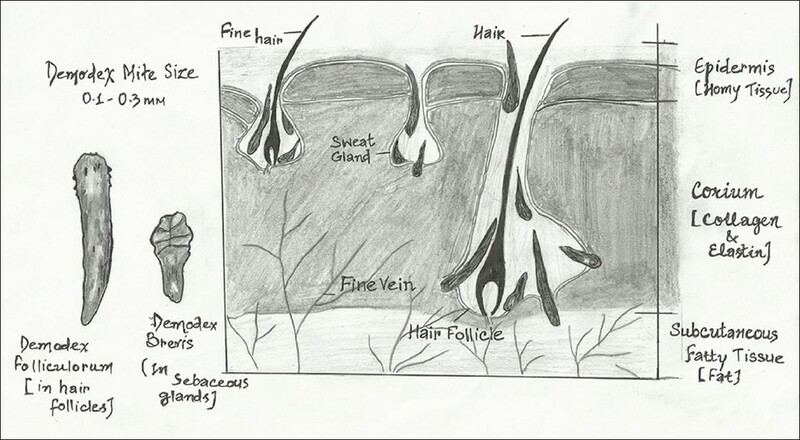 Mating takes place in the follicle opening and eggs are laid inside the hair follicles or sebaceous glands. The six-legged larvae hatch after 3-4 days, and the larvae develop into adults in about 7 days. It has a 14-day life cycle  [Figure 2]. The total lifespan of a Demodex mite is several weeks. The dead mites decompose inside the hair follicles or sebaceous glands. Altered immune system, especially in immune-deficient individuals, which eventually causes a skin disorder. Patients presenting with nonspecific facial symptoms such as facial pruritus with or without erythema, a seborrheic dermatitis-like eruption, perioral dermatitis-like lesions and papulopustular, and/or acneiform lesions without telangiectasia, flushing, or comedones have been found to have significantly higher median mite density , [Figure 5]. The role of D. folliculorum in the pathogenesis of topical corticosteroid-induced rosacea is controversial. , It has been reported that the population of Demodex mites is increased in these patients ,,, [Figure 4]b.
Sebaceous glands of alopecia-affected hair follicles become larger and more active under the influence of dihydrotestosterone, producing oils at a faster rate and, hence, become a more suitable environment for Demodex. In fact, Demodex infestation is considered to be secondary to AGA and not its cause. Several authors suggest that LMDF is a reaction to D. folliculorum; however, a definite association has not been confirmed  [Figure 6]. Exfoliate periodically to remove dead skin cells. Human demodicosis is caused by the clinical manifestation of otherwise asymptomatic infestation of humans by two species of Demodex mite, i.e., D. folliculorum and D. brevis. The etiological role of this versatile mite should be kept in mind as human demodicosis can present as a variety of clinical manifestations mimicking many other dermatoses. This can help in early diagnosis and proper treatment, thereby saving time and at the same time being cost effective. 1. Norn MS. Demodex folliculorum. Incidence, regional distribution, pathogenicity. Dan Med Bull 1971;18:14-7. 2. Rufli T, Mumcuoglu Y. The hair follicle mites Demodex folliculorum and Demodex brevis: Biology and medical importance. A review. Dermatologica 1981;162:1-11. 3. Baima B, Sticherling M. Demodicidosis revisited. Acta Derm Venereol 2002;82:3-6. 4. Aylesworth R, Vance C. Demodex folliculorum and Demodex brevis in cutaneous biopsies. J Am Acad Dermatol 1982;7:583-9. 5. Basta- Juzbasic A, Subic JS, Ljubojevic S. Demodex folliculorum in development of dermatitis rosaceiformis steroidica and rosacea-related diseases. Clin Dermatol 2002;20:135-40. 6. Spickett SG. Studies on Demodex folliculorum Simon. Parasitology 1961;51:181-92. 7. Akbulatova LK. The pathogenic role of Demodex mite and the clinical form of demodicosis in man. Vestn Dermatol Venerol 1963;40:57-61. 8. Burns DA. Follicle mites and their role in disease. Clin Exp Dermatol 1992;17:152-5. 9. Forton F. Dιmodex and perifollicular inflammation in man: Review and report of 69 biopsies. Ann Dermatol Venereol 1986;113:1047-58. 10. Forton F, Seys B. Density of Demodex folliculorum in rosacea: A case-control study using standardized skin-surface biopsy. Br J Dermatol 1993;128:650-9. 11. Bonnar E, Eustace P, Powell FC. The Demodex mite population in rosacea. J Am Acad Dermatol 1993;28:443-8. 12. Forton F, Song M. Limitations of standardized skin surface biopsy in measurement of the density of Demodex folliculorum: A case report. Br J Dermatol 1998;139:697-700. 13. Erbagci Z, Ozgoztasi O. The significance of Demodex folliculorum density in rosacea. Int J Dermatol 1998;37:421-5. 14. Zomorodian K, Geramishoar M, Saadat F, Tarazoie B, Norouzi M, Rezaie S. Facial demodicosis. Eur J Dermatol 2004;14:121-2. 15. Sengbusch HG, Hauswirth JW. Prevalence of hair follicle mites, Demodex folliculorum and D. brevis (Acari: Demodicidae), in a selected human population in western New York, USA. J Med Entomol 1986;23:384-8. 16. Delfos NM, Collen AF, Kroon FP. Demodex folliculitis: A skin manifestation of immune reconstitution disease. AIDS 2004;18:701-2. 17. Franklin CD, Underwood JC. Demodex infestation of oral mucosal sebaceous glands. Oral Surg Oral Med Oral Pathol 1986;61:80-2. 18. Marks R, Dawber RP. Skin surface biopsy: An improved technique for the examination of the horny layer. Br J Dermatol 1971;84:117-23. 19. Crawford GH, Pelle MT, James WD. Rosacea: Etiology, pathogenesis, and subtype classification. J Am Acad Dermatol 2004;51:327-44. 20. Gothe R. Demodicosis of dogs-a factorial disease? Berl Munch Tierarztl Wochenschr 1989;102:293-7. 21. Boge-Rasmussen T, Christensen JD, Gluud B, Kristensen G, Norn MS. Demodex folliculorum hominis (Simon): Incidence in a normomaterial and in patients under systemic treatment with erythromycin or glucocorticoid. Acta Derm Venereol 1982;62:454-6. 22. Hellerich U, Metzelder M. Incidence of scalp involvement by Demodex folliculorum Simon ectoparasites in a pathologic, anatomic and forensic medicine autopsy sample (in German). Arch Kriminol 1994;194:111-18. 23. Caswell JL, Yager JA, Parker WM, Moore PF. A prospective study of the immunophenotype and temporal changes in the histologic lesions of canine demodicosis. Vet Pathol 1997;34:279-87. 24. Barriga OO, Al-Khalidi NW, Martin S, Wyman M. Evidence of immunosuppression by Demodex canis. Vet Immunol Immunopathol 1992;32:37-46. 25. Ivy SP, Mackall CL, Gore L, Gress RE, Hartley AH. Demodicidosis in childhood acute lymphoblastic leukemia: An opportunistic infection occurring with immunosuppression. J Pediatr 1995;127:751-4. 26. Nakagawa T, Sasaki M, Fujita K, Nishimoto M, Takaiwa T. Demodex folliculitis on the trunk of a patient with mycosis fungoides. Clin Exp Dermatol 1996;21:148-50. 27. Patrizi A, Trestini D, D'Antuono A, Colangeli V. Demodicidosis in a child infected with acquired immunodeficiency virus. Eur J Pediat Dermatol 1999;9:25-8. 28. Benessahraoui M, Paratte F, Plouvier E, Humbert P, Aubin F. Demodicidosis in a child with xantholeukaemia associated with type 1 neurofibromatosis. Eur J Dermatol 2003;13:311-2. 29. Akilov OE, Mumcuoglu KY. Association between human demodicosis and HLA class I. Clin Exp Dermatol 2003;28:70-3. 30. Hsu CK, Hsu MM, Lee JY. Demodicosis: A clinicopathological study. J Am Acad Dermatol 2009;60:453-62. 31. Temnikov VE. The peculiarity of immune status in rosacea. Nigniy Novgorod 1991;1:86-8. 32. Petrosjan EA, Petrosjan VA. The treatment of rosacea complicated by demodicosis by extracorporal modification blood of sodium hypochloritis. Vestn Dermatol Venerol 1996;2:42-4. 33. Rufli T, Buchner SA. T-cell subsets in acne rosacea lesions and the possible role of Demodex folliculorum. Dermatologica 1984;169:1-5. 34. Akilov OE, Mumcuoglu KY. Immune response in demodicosis. J Eur Acad Dermatol Venereol 2004;18:440-4. 35. El-Bassiouni SO, Ahmed JA, Younis AI, Ismail MA, Saadawi AN, Bassiouni SO. A study on Demodex folliculorum mite density and immune response in patients with facial dermatoses. J Egypt Soc Parasitol 2005;35:899-910. 36. Lacey N, Delaney S, Kavanagh K, Powell FC. Mite-related bacterial antigens stimulate inflammatory cells in rosacea. Br J Dermatol 2007;157:474-81. 37. O'Reilly N, Bergin D, Reeves EP, McElvaney NG, Kavanagh K. Demodex-associated bacterial proteins induce neutrophil activation. Br J Dermatol 2012;166:753-60. 38. Kaur T, Jindal N, Bansal R, Mahajan BB. Facial demodicidosis: A diagnostic challenge. Indian J Dermatol 2012;57:72-3. 39. Vollmer RT. Demodex-associated folliculitis. Am J Dermatopathol 1996;18:589-91. 40. Roihu T, Kariniemi AL. Demodex mites in acne rosacea. J Cutan Pathol 1998;25:550-2. 41. El Shazly AM, Ghaneum BM, Morsy TA, Aaty HE. The pathogenesis of Demodex follicularum (hair follicular mites) in females with and without rosacea. J Egypt SOC Parasitol 2001;31:867-75. 42. Georgala S, Katoulis AC, Kylafis GD, Koumantaki-Mathioudaki E, Georgala C, Aroni K. Increased density of Demodex folliculorum and evidence of delayed hypersensitivity reaction in subjects with papulo pustulor Rosacea. J Eur Acad Dermatol Venereol 2001;15:441-4. 43. Ayres S Jr, Ayres S III. Demodectic eruptions (demodicidosis) in the human. 30 years' experience with two commonly unrecognized entities: Pityriasis folliculorum (Demodex) and acne rosacea (Demodex type) Arch Dermatol 1961;83:816-27. 44. Hasan M, Siddiqui FA, Naim M. Human demodicidosis. Ann Trop Med Public Health 2008;1:70-1. 45. Ayres S Jr. Demodex folliculorum as a pathogen. Cutis 1986;37:441. 46. Karincaoglu Y, Bayram N, Aycan O, Esrefoglu M. The clinical importance of Demodex folliculorum presenting with nonspecific facial signs and symptoms. J Dermatol 2004;31:618-26. 47. Pallotta S, Cianchini G, Martelloni E, Ferranti G, Girardelli CR, Di Lella G, et al. Unilateral demodicidosis. Eur J Dermatol 1998;8:191-2. 48. Bikowski JB, Del Rosso JQ. Demodex Dermatitis: A retrospective analysis of clinical diagnosis and successful treatment with topical crotamiton. Clin Aesthet Dermatol 2009;2:20-5. 49. Hoekzema R, Hulsebosh HJ, Bos JD. Demodicidosis or rosacea: What did we treat? Br J Dermatol 1995;133:294-9. 50. Ljubojeviae S, Basta JA, Lipozeneiae J. Steroid dermatitis resembling rosacea: Aetiopathogenesis and treatment. J Eur Acad Dermatol Venereol 2002;16:121-6. 51. 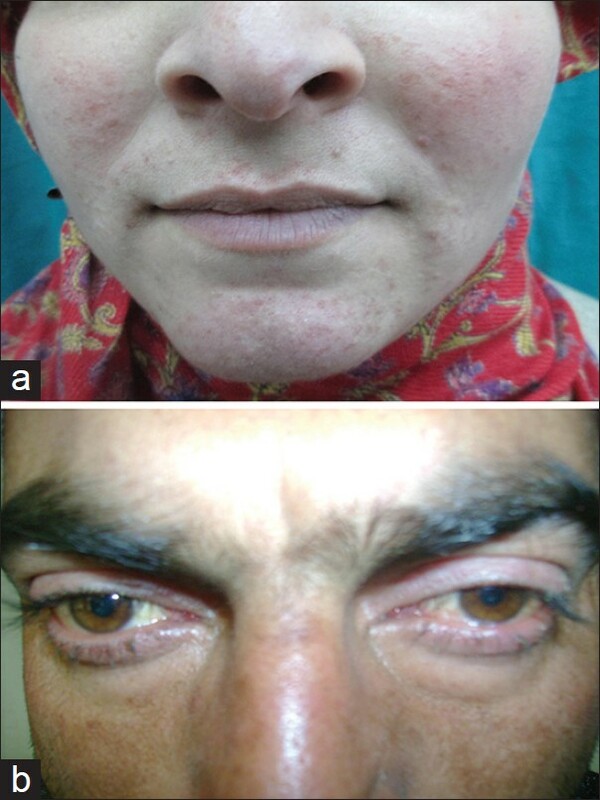 Rathi SK, Kumrah L. Topical corticosteroid-induced rosacea-like dermatitis: A clinical study of 110 cases. Indian J Dermatol Venereol Leprol 2011;77:42-6. 52. Saraswat A, Lahiri K, Chatterjee M, Barua S, Coondoo A, Mittal A, et al. 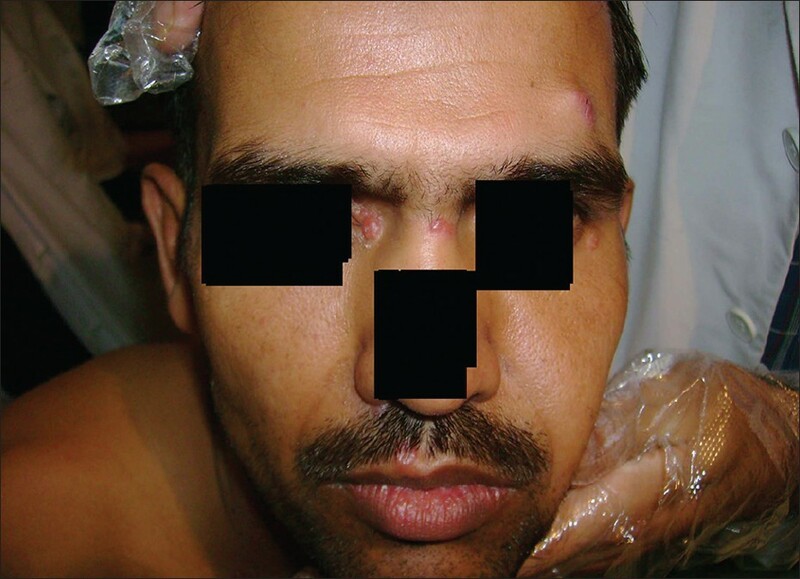 Topical corticosteroid abuse on the face: A prospective, multicenter study of dermatology outpatients. Indian J Dermatol Venereol Leprol 2011;77:160-6. 53. Zari J, Abdolmajid F, Masood M, Vahid M, Yalda N. Evaluation of the relationship between androgenetic alopecia and Demodex infestation. Indian J Dermatol 2008;53:64-7. 54. Jimenez-Acosta F, Planas L, Penneys N. Demodex mites contain immuno reactive lipase. Arch Dermatol 1989;125:1436-7. 55. Mahé YF. Inflammatory perifollicular fibrosis and alopecia. Int J Dermatol 1998;37:416-7. 56. Jaworsky C, Kligman AM, Murphy GF. Characterization of inflammatory infiltrates in male pattern androgenetic alopecia: Implication for pathogenesis. Br J Dermatol 1992;127:239-46. 57. Whiting DA. 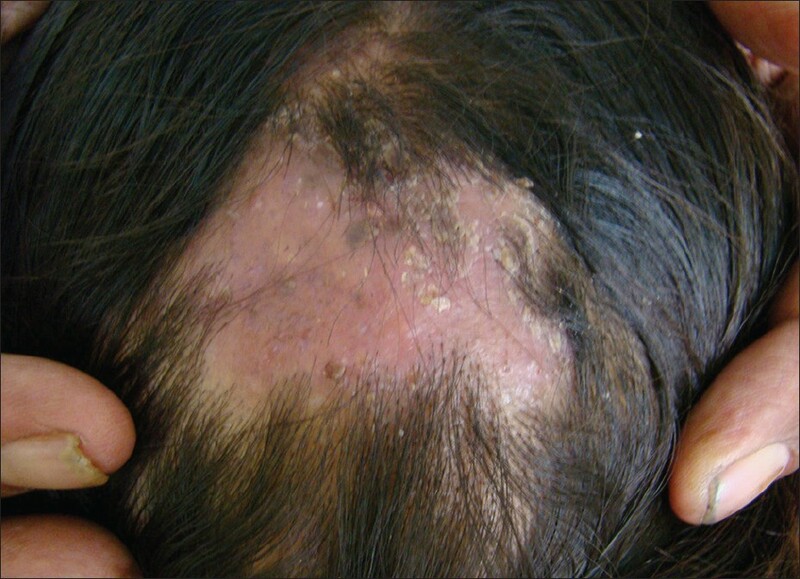 Diagnostic and predictive value of horizontal sections of scalp biopsy specimen in male pattern androgenetic alopecia. J Am Acad Dermatol 1993;28:755-63. 58. Millikan LE. Androgenetic alopecia: The role of inflammation and Demodex. Int J Dermatol 2001;40:475-6. 59. Clifford CW, Fulk GW. Association of diabetes, lash loss and Staphylococcus aureus with infestation of eyelids by Demodex folliculorum (Acari: Demodicidae). J Med Entomol 1990;27:467-70. 60. Sachdeva S, Prasher P. Madarosis: A dermatological marker. Indian J Dermatol Venereol Leprol 2008;74:74-6. 61. Mehta V, Balachandran C, Mathew M. Skin-colored papules on the face. Indian J Dermatol Venereol Leprol 2007;73:368. 62. 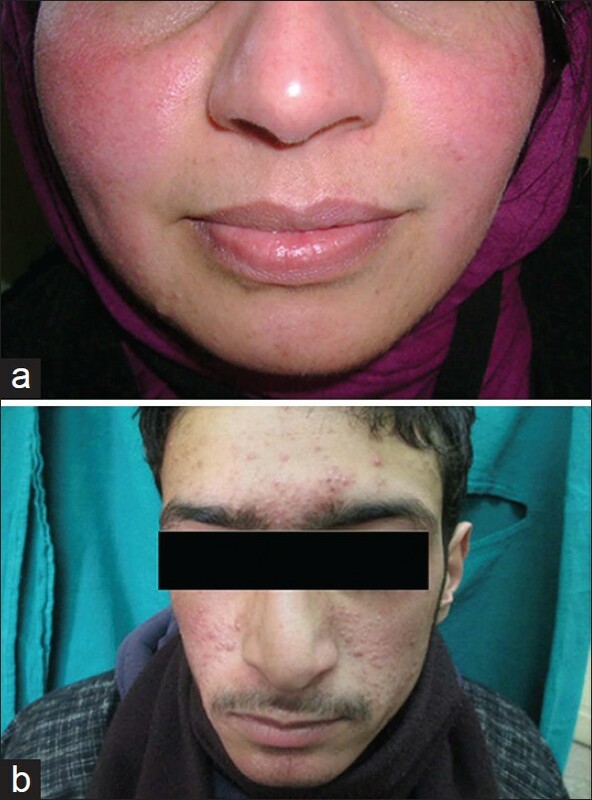 Tchernev G. Folliculitis et perifolliculitis capitis abscedens et suffodiens controlled with a combination therapy: Systemic antibiosis (Metronidazole Plus Clindamycin), dermatosurgical approach, and high-dose isotretinoin. Indian J Dermatol 2011;56:318-20. 63. Pena GP, Andrade Filho JS. Is Demodex really non-pathogenic? Rev Inst Med Trop Sao Paulo 2000;42:171-3. 64. Wolf R, Ophir J, Avigad J, Lengy J, Krakowski A. The hair follicle mites (Demodex spp. ): Could they be vectors of pathogenic microorganisms? Acta Derm Venereol 1988;68:535-7. 65. Namazi MR. A possible role for human follicle mites in skin's defense against bacteria. Indian J Dermatol Venereol Leprol 2007;73:270. 66. Gamborg Nielsen P. Metronidazole treatment in rosacea. Int J Dermatol 1988;27:1-5. Demodex mite should be considered as an aetiological factor for a number of dermatoses for their early diagnosis and appropriate treatment.